My grandfather, Carl Leroi Boynton Wheeler, was born at the end of the nineteenth century with what my family called “the horse gene” deep in his blood. As a little girl, I sometimes bugged him to tell me “horse stories.” There were four thoroughbred colts my grandfather cherished: Man O’ War, Gallant Fox (“The Fox”), Count Fleet (“The Count”) and Citation. They garnered his love and respect until the last days of his life. 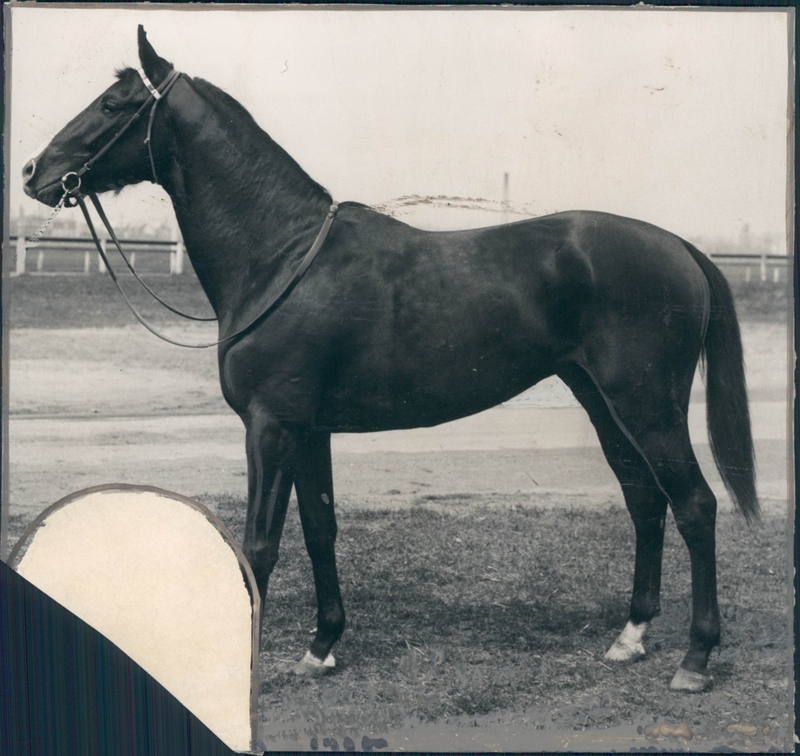 Whereas Man O’ War was incomparable, “The Fox,” “The Count” and Citation were the benchmark against which all other thoroughbreds — including Canada’s hero, Northern Dancer — were measured. 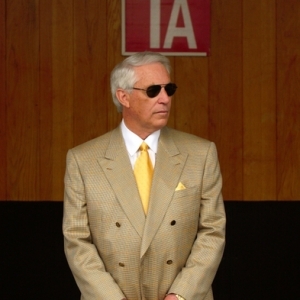 As we move closer to the 2013 Triple Crown races, THE VAULT joins in the excitement with this weave of Grandpa Wheeler’s reckonings, together with other credible sources of the time, to tell the story of the unlikely colt who brought joy to North America in a time of fear and uncertainty. Gallant Fox, shown here in a rare portrait without the famous Belair stable blinkers! That white around one eye (“wall eye”) was said to intimidate other horses — one of those popular beliefs of the day that has never really been proven. Photo and copyright, The Chicago Tribune. The Fox’s sire, Sir Gallahad III, raced in France where he was brilliant. 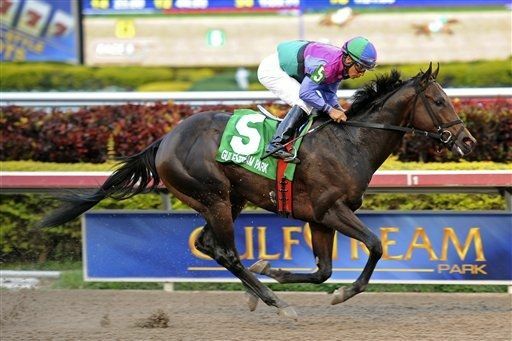 Shortly after going to stud, Sir Gallahad III was sold to the American partnership of William Woodward Sr., A.B. Hancock, Robert A. Fairburn and Marshall Field III. 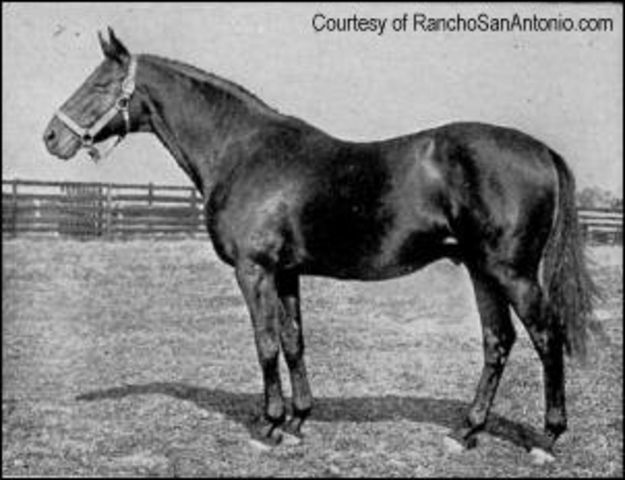 The stallion stood mainly at Woodward’s famous Belair Stud and at Hancock’s Claiborne. He is best remembered as the sire of three Kentucky Derby winners (Gallant Fox, Gallahadion and Hoop Jr.), as well as one Triple Crown winner (Gallant Fox). 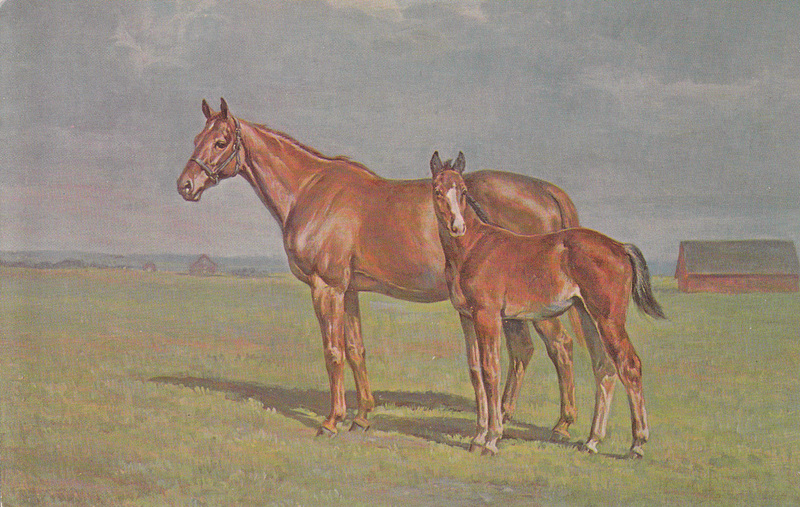 The broodmare Marguerite (shown here with Gallant Fox as a colt) was a great granddaughter of Domino, through Celt, a son of Commando. A Blue Hen, she was bred twice to Wrack and produced the champion, Peetee-Wrack. Other than Wrack, her only other matches were to Sir Gallahad III. As Hancock put it, “If you’re trying to strike oil, you drill in the same field where it’s been struck before.” The “first strike”was Gallant Fox. Although Marguerite never produced another like him, sons Fighting Fox and Foxbrough won races on both sides of the Atlantic. Her daughter, Marguery, is the tail-ancestress of modern-day champions Generous (Caerleon), Imagine (Sadler’s Wells) and Albertus Maximus (Albert the Great). This story is about a great thoroughbred, but not one in the tradition of Seattle Slew, Affirmed or the immortal Secretariat. 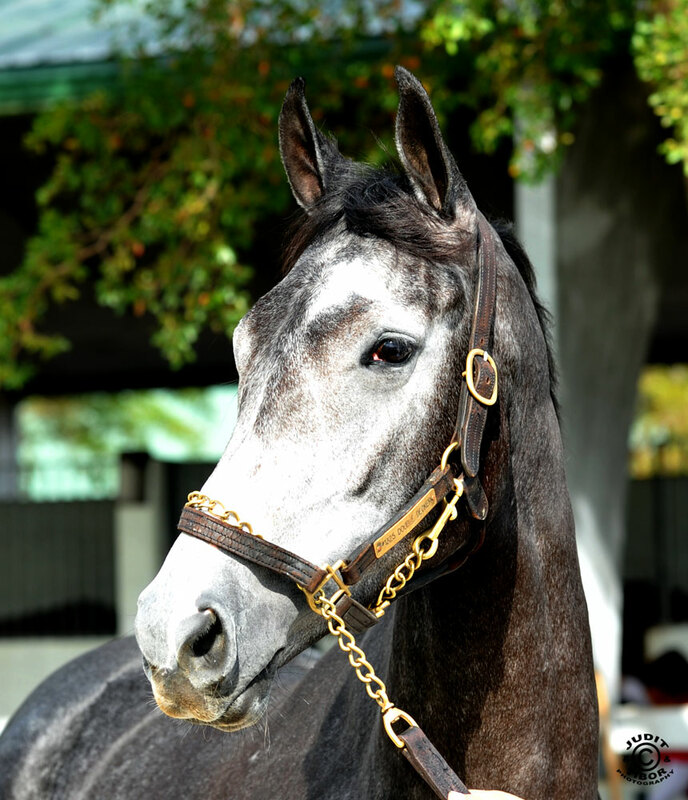 This colt was a dreamer….always more interested in the world around him than he was in racing. Like Hyperion, he hated to be in training unless there was another horse to chase and catch. And once he’d moved on by the other horse, our subject was inclined to slow to a languid canter, while his eyes hunted the landscape for something really interesting. Fortunately, he had a kind nature and so would do what was asked of him on the track….most of the time. Exciting as horse racing may be for humans, the life of a typical race horse, then as now, is filled with structure and routine. Not terribly interesting for a colt who, in another life, was almost certainly an explorer or a poet or even a philosopher. As those who knew him best would expect, even after winning the Preakness, our boy (blinkers and all) is scouring the environment for something more interesting than the smiles of his fan club. Photo and copyright, The Baltimore Sun. Marguerite’s boy was a big, handsome colt with a wide, white blaze that ran from his forehead to curl around each nostril, a “wall eye” and four white coronets. Of the eye, it would be said that it gave him a fierce, wild look that put paid to any horse who dared to draw up beside him. Named Gallant Fox, the colt foal was born on March 23, 1927 and was quick to show his intelligence and the kind of curiosity that goes with it. By the time he hit the track in his 3 year-old season, Gallant Fox was walking into a world of shattered dreams. It was 1930 and North America needed something that transcended a faltering economy and lives lost to the cruelty of the unforeseen. His bloodlines were impeccable. 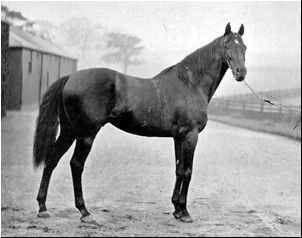 His sire, Sir Gallahad III was by Teddy (Ajax) out of Plucky Liege (Spearmint), one of the most important broodmares of the 20th century. Plucky Liege (1912) boasted the prepotent St Simon as her broodmare sire, as well as three crosses to another influential stallion, Stockwell. 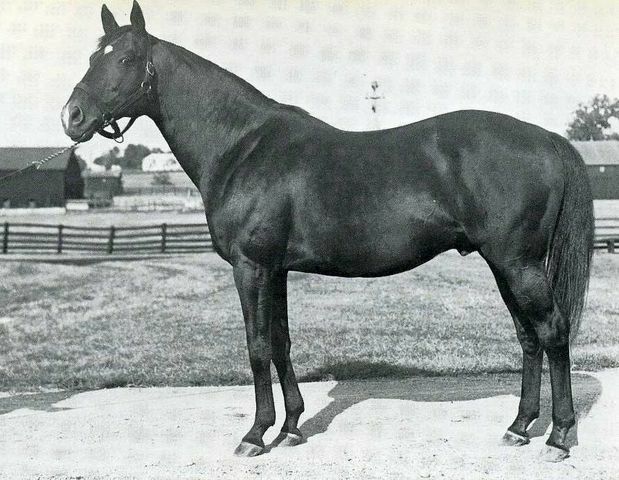 Other than Sir Gallahad III (one of America’s most influential sires), Plucky Liege also produced Bull Dog (sire of the brilliant Bull Lea), Derby winner Bois Roussel (broodmare sire of champion filly, Petite Etoile) and Admiral Drake (leading sire in France in 1955). Bull Dog was another American foundation sire produced by Plucky Liege. Gallant Fox’s dam, Marguerite, was a direct descendant of Domino through her sire, Celt. As well, illustrious names filled her pedigree: Bend Or (Derby and St. James Palace Stakes, Epsom Gold Cup), Doncaster (Epsom Derby, Ascot Gold Cup), St. Simon (champion sire and undefeated in 10 starts in the UK) and Lexington (leading American sire 16 times). St. Simon was said to have perfect confirmation, a seemingly indefatigable fighting spirit and an exceedingly high-strung temperament. 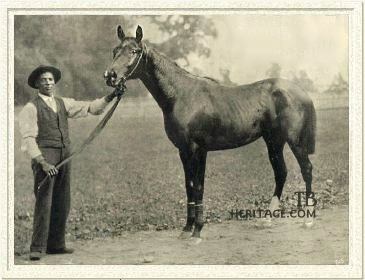 The legendary Domino line was responsible for Gallant Fox’s dam, Marguerite, who was a direct descendant. 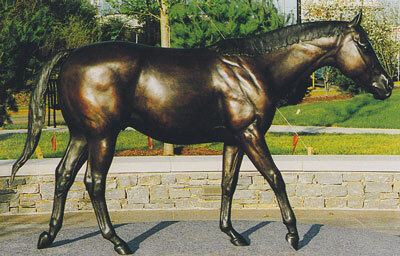 Sculptor Gwen Reardon’s figure of the stallion, Lexington, adorns Kentucky’s Horse Park. There was no question that powerful blood ran in the veins of Marguerite’s curious son. 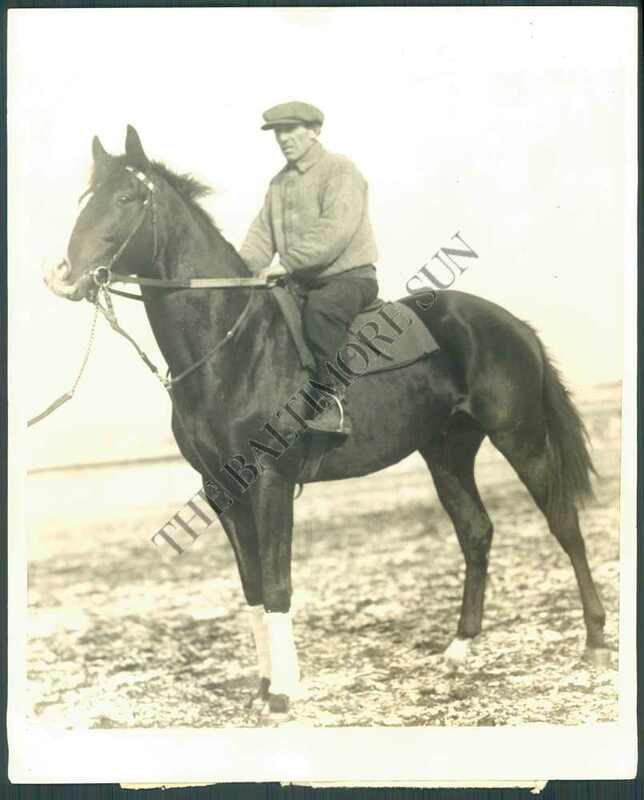 As a juvenile, Gallant Fox aka “The Fox of Belair,”or simply”The Fox,” was sent to one of America’s greatest trainers, James Edward (“Sunny Jim”) Fitzsimmons. “Mr. Fitz,” as he was fondly called, had come up through the ranks the hard way, beginning as a stablehand at the age of 10. He knew his thoroughbreds inside-out by the time The Fox arrived in his stable. Mr. Fitz was one of those trainers who was most himself around the barn with his horses. Gallant Fox, he was quick to discover, only trained his best in the company of another horse. Left on his own, the youngster was happier to watch the world go by and this meant, in turn, that he was never keen to be interrupted in order to head out to the track. The Fox wasn’t really a fractious colt, but like so many great thoroughbreds he didn’t like to be pushed around. You couldn’t dominate him — you had to partner up with him. So, Mr. Fitz selected a training trick that seemed to suit them both: the relay race. It involved a number of colts, each of whom took The Fox on at a different point around the track. The colt responded mightily to the challenge, refusing to be headed by another horse. It was a good thing that Mr. Fitz was running a large stable, because not one of his other horses could keep up with The Fox all the way around the track. Gallant Fox was more interested in everything going on around him than he was in racing. Although Mr. Fitz never doubted his courage, intelligence or ability, it took some doing to train him. Shown here at trackside, just checking out the action, The Fox is so intent that he poses all alone for the camera — barely moving a muscle. 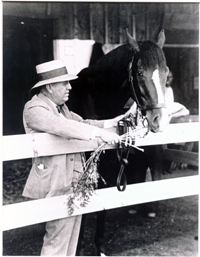 HOF trainer, “Sunny Jim” Fitzsimmons (foreground) pictured with his 1939 Kentucky Derby winner, Johnstown. “Mr. 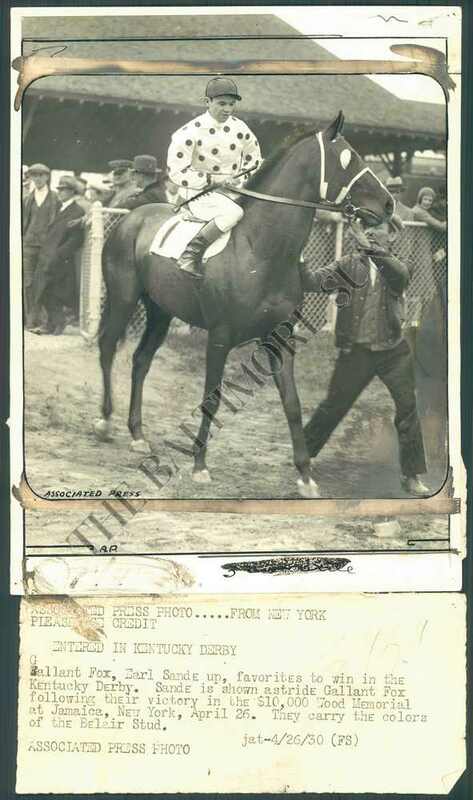 Fitz” dominated American horse racing’s “Golden Age.” He trained two Triple Crown winners (Gallant Fox and Omaha) and won the Derby three times, the Preakness four times and the Belmont, six times. 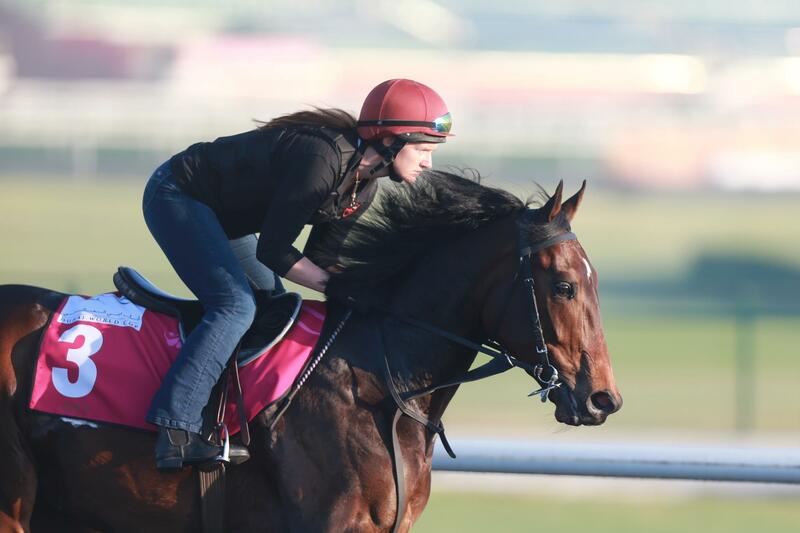 Other notables trained by Mr. Fitz included Dark Secret, Bold Ruler, Nashua and Granville. All told, the trainer sent out 155 stakes winners to capture 470 stakes races during his career. As well as training for Woodward’s Belair Stud, Mr. Fitz also trained many champions who ran in the colours of the Phipps’ family. In his 2 year-old campaign, Gallant Fox continued to be calm, friendly….and insatiably curious. In the second start of his career, the colt was left at the starting gate — looking at an airplane in the sky overhead. He did, eventually, get going but it was too late to finish in the money — the only time in his career that he wouldn’t. It was in the Flash Stakes, on his third try, that The Fox broke his maiden, although the second-placed Caruso would beat him four days later. In his fifth start, the Futurity Trial, the Woodward colt seemed to get the hang of it and he put in a good effort, almost catching the winner, Polygamous, at the wire. 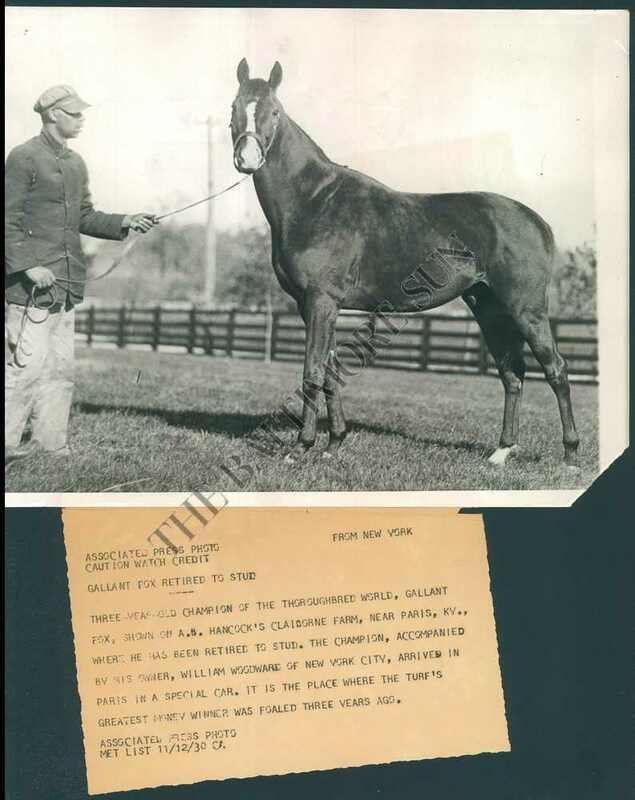 Next came the Futurity itself, where the 2 year-old star of the 1929 racing season, Whichone, hooked up with The Fox for the first time. 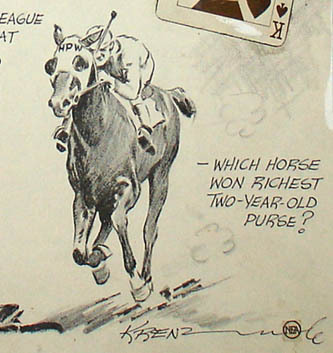 Artist Art Krentz’s sketch of champion, Whichone, done in 1929. As it turned out, The Fox couldn’t quite catch Whichone. But he gave it his best shot, ending up in a tie for second place which he lost by a nose, to place third. 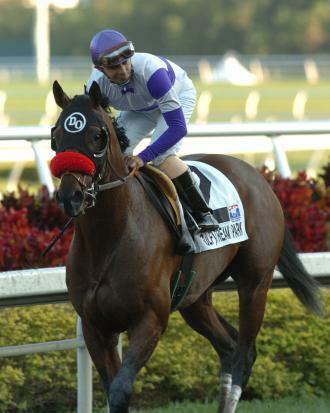 The Fox’s last start of the season was in the Junior Champion Stakes at Aqueduct, which he won going away. 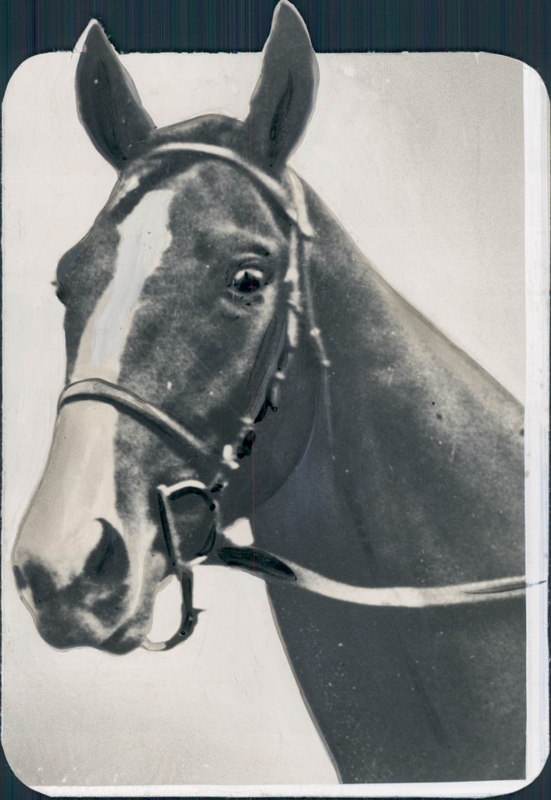 Whichone captured Champion 2 year-old honours that year, but Gallant Fox was on the radar as “one to watch” in 1930. His flip-flop juvenile season didn’t faze either his owner or his trainer: like many in their day, neither William Woodward Sr. nor Mr. Fitz saw a colt’s 2 year-old season as a more than a dress rehearsal for what lay ahead. The Fox at three was stronger and more experienced. Of the colt, Grandpa Wheeler said, “He could look a bit like a plough horse but he was a blue-blood through and through. He got the Triple with his ears pricked forward.” Photo and copyright, The Baltimore Sun. As youngsters do, Gallant Fox grew into his 3 year-old year a stronger, more experienced horse. He was joined by jockey Earl Sande, who had been persuaded to come out of retirement to ride him. Sande had been a champion jockey in his day, riding horses like Zev, Flying Ebony and the great Man O’ War (once) to victory. 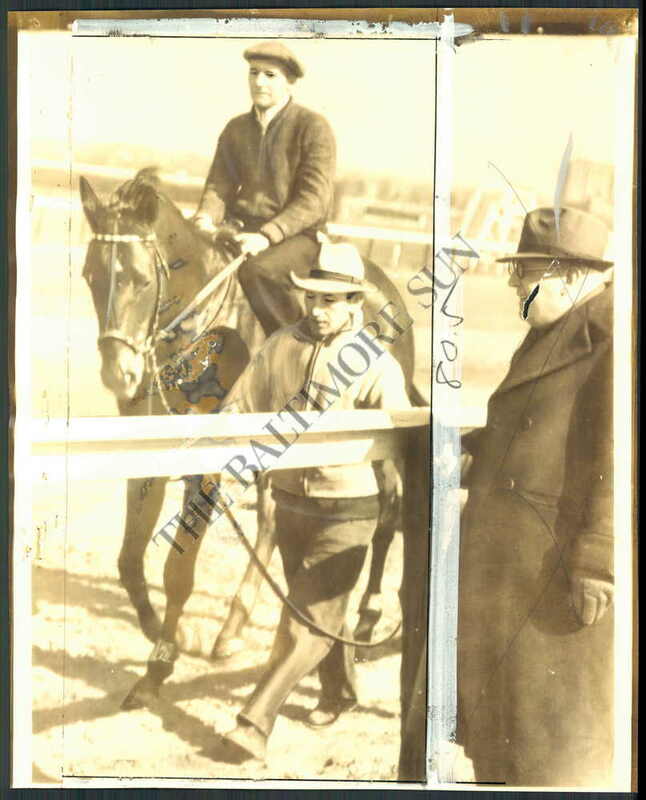 Damon Runyon had even penned him a poem, “There Never Was A Guy So Handy As Sande.” Retiring in 1927, Sande decided to try his hand at training, but his wife died that same year and the champion jockey fell apart. Overweight and almost penniless, Sande headed back to what he knew best, only managing a single win in the 1929 season. In the meantime, Mr. Fitz was working hard with The Fox to get him to focus on racing rather than sightseeing. He positioned him in the stable so that the 3 year-old could watch all the action and when Mr. Fitz was talking to someone, he’d often acknowledge the colt by reiterating, “Isn’t that so, Mister?” And The Fox would nod his head in agreement. The trainer also indicated to Woodward that it would be ideal if they could land a single jockey for the colt’s 3 year-old season. It was his feeling that The Fox would do his best in the hands of an experienced rider, one who would form a real relationship with him and learn to handle his strengths and quirks. “Isn’t that so, Mister?” Mr. Fitz and The Fox. The colt didn’t have a mean bone in his body. But he was a character and although Mr. Fitz had managed to improve his attitude and work ethic, The Fox still had his moments. For one thing, the coppery bay with the wild eye had a tendency to dawdle once he got on the lead: if there was nothing in front of him, The Fox just couldn’t see the point of knocking himself out. It was equally tricky to get him to rate just off the pace. Too, he was quite capable of coming to a sudden halt if something of interest caught his attention, blinkers or no. Heeding Mr. Fitz’s advice, Woodward, acting on the recommendations of his trainer as well as that of Doc Pardee, manager of the Biltmore Stable in Arizona, approached Earl Sande. Gallant Fox with Earl Sande in 1930. The two would form a partnership as legendary as that of Ron Turcotte and Secretariat. It was, as they say, “a match made in heaven.” Not only did Sande ride Gallant Fox into thoroughbred legend, he also groomed and worked him. Sande taught the colt to play guessing games, hiding treats behind his back. And they seemed to be in a constant conversation that often ended with the colt butting Sande out of his stall. Best of all, Sande adored Marguerite’s handsome son and the colt revelled in his attentions. It was fun when Sande was around and Mr. Fitz began to notice that The Fox’s attitude was improving, largely because he wanted to please his new buddy. For the first time, in a consistent way, Mr. Fitz saw his colt show a competitive edge when training with other horses. Earl Sande wasn’t one to use his whip unnecessarily. He had quiet hands and a patient way of working with his young horse. The combination of Mr. Fitz’s wisdom and Sande’s quiet confidence in The Fox framed what was to be an absolutely brilliant 3 year-old campaign. The Fox’s season began with the Wood Memorial, where he met up with the dashing Crack Brigade, owned by Thomas Cassidy. 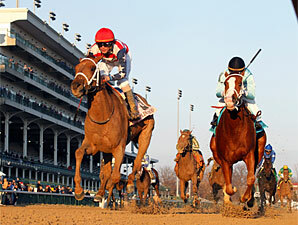 Despite getting a less-than-ideal trip, Gallant Fox beat Crack Brigade by 4 lengths. Next, it was on to the Preakness, which in that year was run before the Kentucky Derby at a distance of 1 3/16 (the same distance as today). The Fox and Earl Sande after winning the Wood Memorial. As Sande had told the press, “As long as there is a horse in front of The Fox, you can ride him backwards. He’ll use his competitive spirit to find a way to win.” Photo and copyright, The Baltimore Sun. The Fox would again take on Crack Brigade, as well a really lovely filly named Snowflake, who came home third. 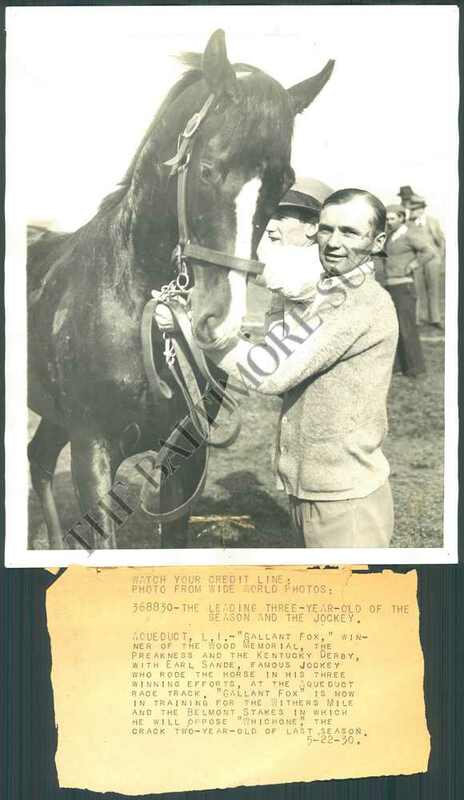 Snowflake, owned by Walter J. Salmon, would end her 3 year-old campaign taking champion co-honours with the more famous Alcibiades, owned by Hal Price Headley. She was that good. 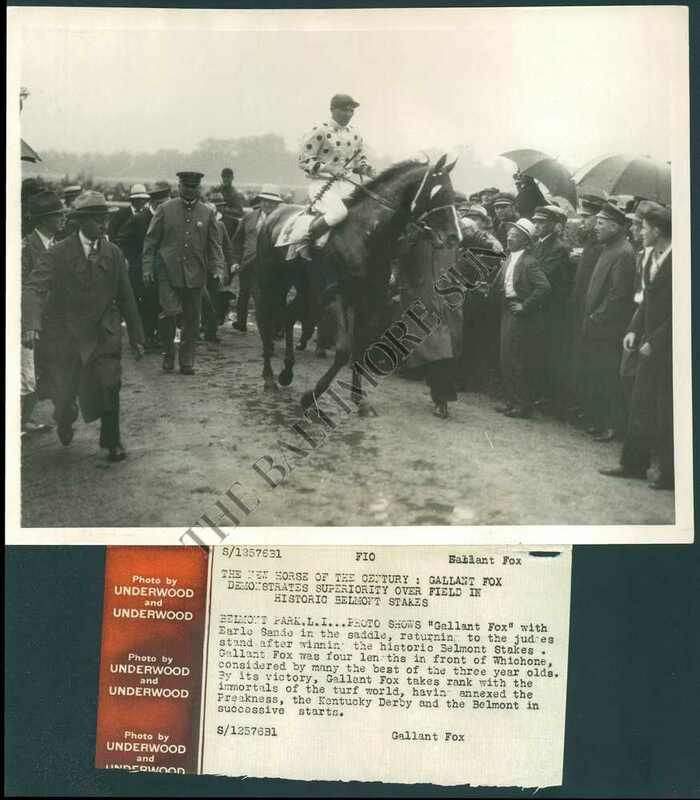 William Woodward won his first Preakness and Earl Sande rode his first Preakness winner when Gallant Fox captured Maryland’s greatest turf classic before 40,000 persons at Pimlico today. The son of Sir Gallahad III and Marguerite came from next to last position at the half-mile mark to the heels of Thomas Cassidy’s pace-making Crack Brigade at the mile. Three-sixteenths further, the end of the race, and Gallant Fox was the winner by three-quarters of a length and had earned $51, 925. The time was 2.00.35. Gallant Fox comes home in The Preakness, ears pricked forward. The Fox won it in the second quickest time ever recorded. Photo and copyright, The Baltimore Sun. Next up was the Kentucky Derby. 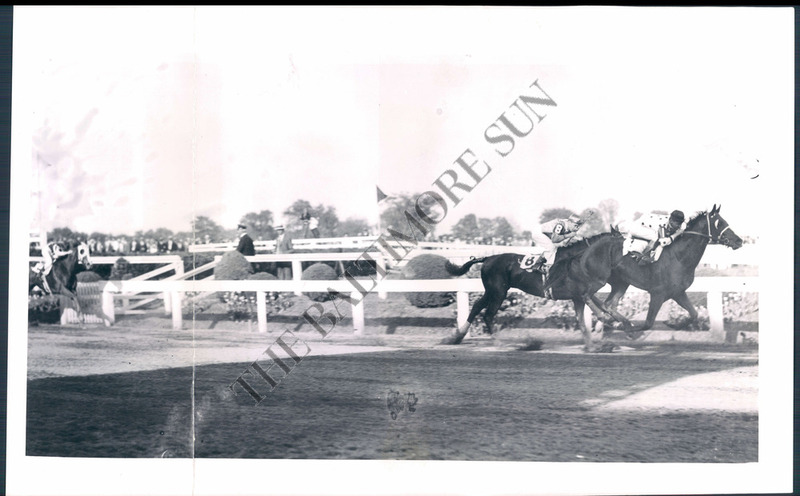 Other runners included second-place finisher in The Preakness, Crack Brigade, as well as the filly Alcibiades and Tannery, the “pride of the Bluegrass” and the colt thought to be the best hope of defeating The Preakness winner. Gallant Knight and Ned O. rounded out the favourites the field of fourteen. The day was rainy and grey, but this didn’t deter the fans, who began rushing in at 7 a.m. when the gates opened. By race time, an estimated 60,000 had assembled. Among the spectators, the most distinguished was undoubtedly England’s Lord Derby, who was housed in a glass pagoda near the finish line with William Woodward and other luminaries of American racing. 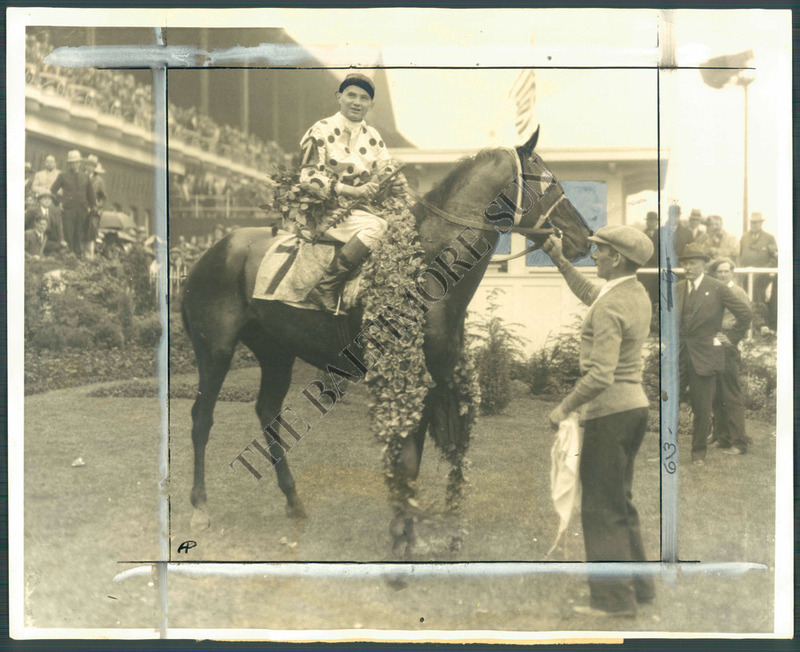 In the winner’s circle, wearing the famous wreath of roses. Gallant Fox had come home to win the Derby in the pouring rain, with Earl Sande’s gentle hands encouraging him on. Photo and copyright, The Baltimore Sun. It was Lord Derby of England turning to William Woodward , owner of the horse, which stands alone tonight as the champion 3 year-old in America. … Gallant Fox and Sande saluted the stewards, were drawn into the tiny protected oblong of greensward next to Lord Derby’s pagoda and Mr. Woodward stepped out into the rain. Without a topcoat, he strode across the lawn and grasped Sande’s hand and congratulated him on riding his third Derby winner, the first jockey to do this since Isaac Murphy in the previous century. 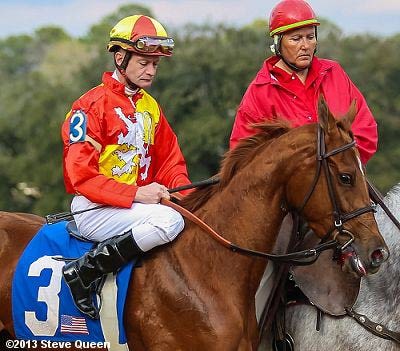 All seemed as it should be for Gallant Fox’s Belmont, until — just two days before the race — Earl Sande was involved in a horrendous car crash with fellow jockey, Harry Gross. Sande got away with cuts to his hands and face, so it was a bandaged Earl Sande who rode “The Fox of Belair” — the latest monicker picked up by the Woodward colt — onto Big Sandy on Belmont Stakes day. Rain was lashing down in thick, grey sheets. And back to contest the Belmont was The Fox’s nemesis, Whichone, still considered by many to be the best 3 year-old in the country. But the red-hooded Fox strode past the stands to the start with his typical nonchalence, Sande sitting quietly, the reins slackened over the colt’s withers. The first fractions were slow, but The Fox was on the lead and held it throughout. Each time another horse tried to get close to him, Sande let out the reins a notch and The Fox was off again. There was no speed duel between Whichone and Gallant Fox, as had been anticipated. Instead, The Belmont became a procession, with a champion in the lead. William Woodward’s colt crossed the finish line 4 lengths ahead of Whichone, going away. The Fox had won the “triple crown” under a hand ride and his victory marked the christening of the term “Triple Crown” to describe a winner of the Kentucky Derby, Preakness and Belmont Stakes. 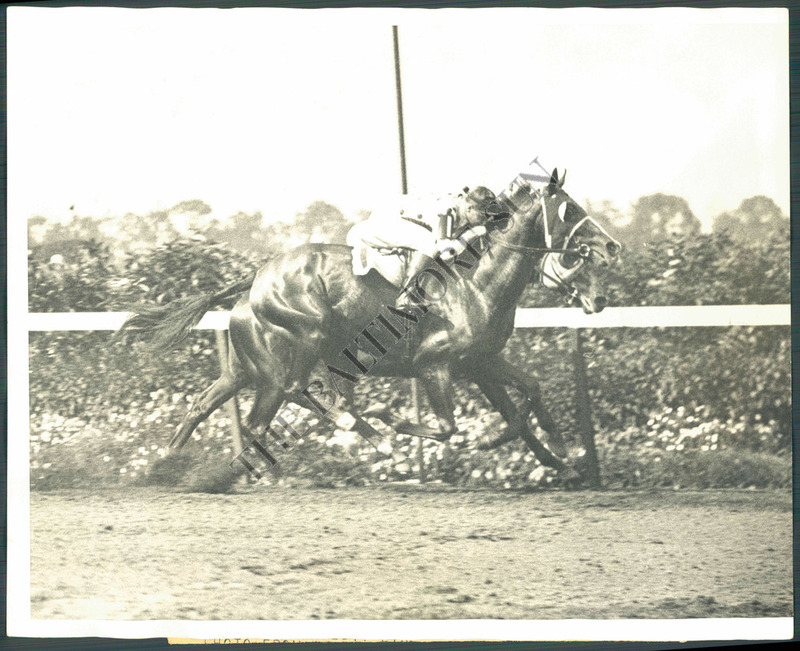 The running of the 1930 Belmont Stakes. Gallant Fox is just getting ready to leave the Whitney’s Whichone behind in the stretch. The Fox’s win set a Belmont Stakes track record. Photo and copyright, The Baltimore Sun. William Woodward leads in his Triple Crown winner. Gallant Fox got a little fractious in the winner’s circle, even though his proud owner managed to hang on to him until Mr. Fitz arrived. Photo and copyright, The Baltimore Sun. Questionnaire, shown at stud, handed Gallant Fox one of the toughest challenges on the track. Gallant Fox was retired to Claiborne Farm after his Gold Cup win when he came up with a fever and cough. His all-too-brief appearance on the stage was always recollected with a certain melancholy by my grandfather, who stressed that the champion was “just starting to show his real mettle” late in his 3 year-old season. 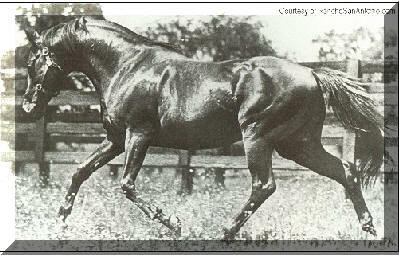 At stud, Gallant Fox produced a third Triple Crown winner in his very first crop, at the age of 5: Omaha. He also sired Flares, a full brother to Omaha, who won the Ascot Gold Cup, as well as the 1936 Horse of the Year, Granville. He was a moderately successful sire; his full brother, Fighting Fox, was less successful as a runner but more consistent in the breeding shed. Still, Gallant Fox remains the only Triple Crown winner to sire a Triple Crown winner and that only adds to his cachet. Gallant Fox’s full brother, Fighting Fox. Photo and copyright, The Baltimore Sun. 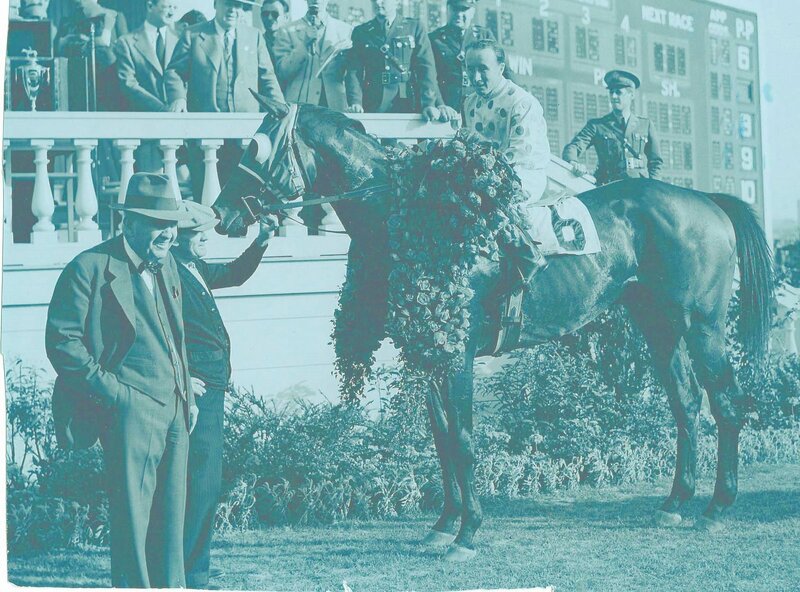 When he died in 1954 Gallant Fox was laid to rest at Claiborne, where he had first come into the world. 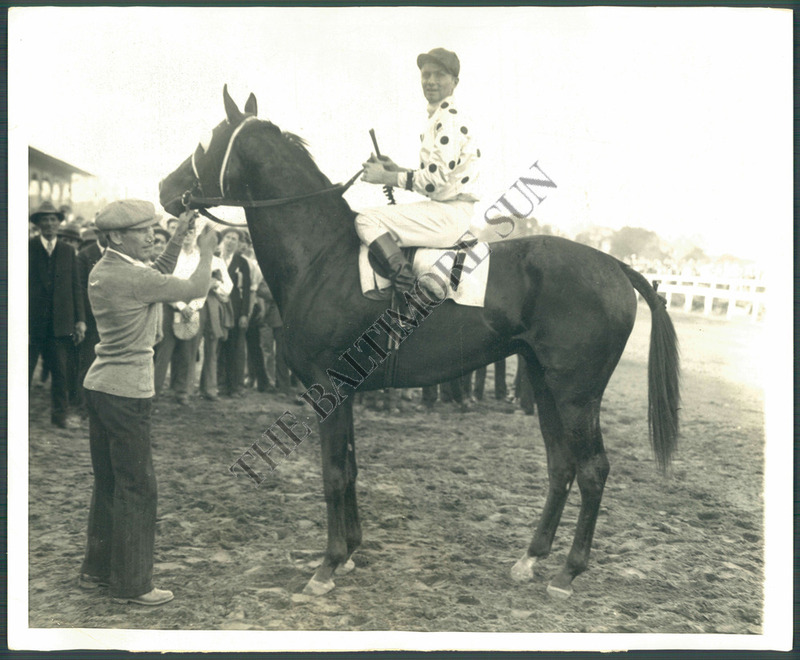 His epitaph reads, “He swept like a meteor across the racing sky of 1930” — a fitting tribute to a thoroughbred whose dignity, determination and capacity to dream illuminated the darkness of the Great Depression.